Review posted May 4, 2018. Okay, this book honestly made me laugh out loud. I’d never noticed how many different ways stormtroopers die in the Star Wars movies. 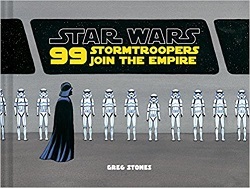 Ninety-nine stormtroopers join the Empire. We see a relatively calm picture of Darth Vader reviewing his troops. But one by one and group by group, bad things happen to the new recruits. One stormtrooper becomes bantha fodder…. One stormtrooper fails to shoot first…. One stormtrooper asks for a promotion…. Two stormtroopers underestimate a princess…. One stormtrooper doesn’t let the Wookiee win…. Thirty-six stormtroopers are stationed on Alderaan…. Instead of page numbers, we’ve got a running count of how many stormtroopers are left. The last lucky stormtrooper lives happily ever after… on the Death Star. I’m afraid this may be the book that gets me to count stormtrooper deaths the next time I watch a Star Wars movie.